The official opening of the tournament will take place on 13 June 2010 at 9:30 CET hours at the playing venue. The drawing of lots will take place at 16:00 CET. The tournament is a double round-robin system, beginning from 14 June 2010. The rounds are scheduled daily from 14:30 CET hours, except the last round which will be from 12:30 CET hours. 120 minutes for the first forty moves, 60 minutes for the next twenty moves and then each player will be allotted 15 minutes until the end. Starting with move 61 each player will receive an increment of 30 seconds per move. The live coverage of the Bazna Kings tournament starts at 14:30 CET. Today’s featured game will be between Magnus Carlsen and Ruslan Ponomariov. It will be commented live by GM Christian Bauer and IM Alexander Ipatov. The other pairings of the day are Nisipeanu – Radjabov and Gelfand – Wang Yue and you can follow them with computer analysis here and here. No draw agreement by the players are allowed before move 30. * in theoretically drawn position. * A tie-break match will be played in case of a tie for the first place in the tournament between the first two players in the final standing (according to points, or the additional criteria). The match will consist of two games with a time-control of 15 minutes per player + 3 seconds added for every move played. In case of a tie, another match of two blitz-games will be played with a time-control of 5 minutes per player + 3 seconds for every move played. In case of another tied result – there will be played a last “sudden-death” decisive game with a time-control 5 minutes for the whole game for the White-player and 4 minutes for the whole game for Black-player. The White-player will only need a victory in this game to win the tournament; whole the Black-player will win the tournament by just not losing that final decisive game. * In case the first place might be shared by more than two players – the final standing will be determined according to the criteria that have been mentioned above. punished – it is regulated by the FIDE Laws. enables recording of the moves and following of the course of a chess game. The system also provides simple solution for Fischer Random – Chess960. If you want to know the rules of new chess notation, please download the PDF file. c) Proposed prize fund for the players (minimum 1,000,000 euros should be offered net of any applicable taxes). g) Category of official hotel (minimum 4- stars), and name if possible, with special room rates including meals. j) The applicant’s name, signatures and authentication. 3.In order for a proposed bid to be considered, it should be accompanied by a 8-month term bank guarantee covering the amount of prize fund (minimum 1,000,000 euros), the FIDE contribution (20% over and above the prize fund), 5% for WCO budget and 5% for the commercial rights and 32,500 euros covering stipends of Principals as described in article 14.4 of the match regulations. This guarantee should be from a bank that FIDE bankers, UBS of Switzerland, are able to confirm as acceptable. Alternatively to the above paragraph, a bidder can deposit in FIDE’s bank account the amount of 100,000 euros by the deadline of 30 September 2009 (refundable if the bid is rejected), another 60% of the prize fund by 30 November 2009 and the balance by 21 January 2010. 6.The bids, including all original documents and particulars, shall arrive by registered post to the FIDE Secretariat, post address: 9 Syggrou Ave., 11743 Athens – Greece. The bidding process will close on 30 September 2009, 13:00 GMT. Many readers have requested the detailed rules of the Nanjing chess tournament that is going to take place December 10-22. Although there are no regulations on the official website, we have managed to collect the most interesting information through various sources. The tournament will be double round robin FIDE rated event. The total prize fund is 250 000 eur, as 80 000 go for the winner and the last one receives 20 000 eur. The tournament dates are 10-22 December, as the first playing day is December 11. The time control 90 min for 40 moves + 1 hour to the end of the game is yet to be confirmed. Round 1, (with live commentary on Chessdom.com) will start at 3:00 pm local time (8:00 AM CET) while the other rounds begin at 2:30 pm (7:30 AM CET). The time zone of Nanjing is GMT/UTC + 08:00 hour. Pearl Spring will be the last event of Topalov before the challengers match with Gata Kamsky. 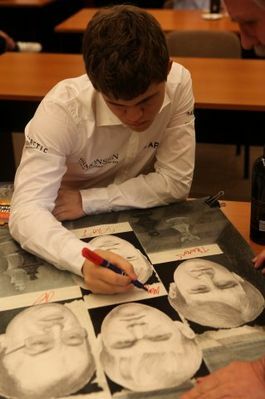 After the China event he will start the preparation for the match with his second Ivan Cheparinov. The ex world champion is already on his way to China (with a transfer flight through Frankfurt). He will have a press conference the day after his arrival. 1.1 Format & System Match System: The Challenger’s Match between Gata Kamsky and Veselin Topalov in 2009 will consist of 8 games and possible tie-breaks. The winner qualifies for the World Championship Match 2009. The closing ceremony shall take place on the day after the match has been decided or one day thereafter. 3.1 The Players shall be entitled to inspect the accommodation arranged for them at the Venue three (3) days before the first game of the match and shall be entitled to make reasonable requests regarding such accommodation which the organizer shall use all reasonable endeavors to accommodate. 3.2 The Players – shall inspect the playing hall in the presence of the Chief Arbiter, the Chairman of the Appeals Committee and representatives of FIDE, two (2) days before the first game of the match at 3.00 p.m. The Organizing Committee shall use all reasonable endeavors to satisfy the reasonable requests of the players in relation to the playing hall. 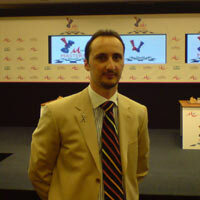 In the event of a dispute between the Players as to the condition and suitability of the playing hall the Executive Director of the Organizing Committee together with the FIDE President, shall decide about such dispute. Their decision shall be final and binding. 3.3 No postponement of any game shall be allowed except with permission of the FIDE President after consultation with the with the Chief Arbiter. 3.4.1 The draw for colors will be conducted during the opening ceremony. The colors shall be reversed after game 4. (The player getting the white color in game 1 shall play game 5 with the black color). 3.4.2 For tie-break games, there shall be a separate drawing of lots conducted by the Chief Arbiter of the match. 3.5.1 The time control for each game shall be: 120 minutes for the first 40 moves, 60 minutes for the next 20 moves and then 15 minutes for the rest of the game plus an additional 30 seconds per move starting from move 61. 3.5.2 The games shall be played using the electronic clocks and boards approved by FIDE. 3.6.1 The match shall be played over eight (8) games and the winner of the match shall be the first player to score 4.5 points or more. A tie shall be broken according to article 3.7 below. If the winner scores 4.5 points in less then 8 games then the organizers can re-schedule the Closing Ceremony for an earlier date. 3.6.2 If any player refuses to participate in the Challenge’s Match, the other player qualifies for the World Championship Match 2009. 3.7.1 If the scores are level after the regular eight (8) games, after a new drawing of colors, four (4) tie-break games shall be played. The games shall be played using the electronic clock starting with 25 minutes on the clock for each player with an addition of 10 seconds after each move. 3.7.2 If the scores are level after the games in paragraph 3. 7. 1, then, after a new drawing of colors, two (2) five-minute games shall be played with the addition of 10 seconds after each move. 3.7.3 If the score is still level, the players shall play a single decisive sudden death game. The player, who wins the drawing of lots, may choose the color. White shall receive 6 minutes, black shall receive 5 minutes, without any addition. In case of a draw the player with the black pieces is declared as winner. 3.7.4 Play shall be governed by the FIDE Laws of Chess for Rapid and Blitz Games (Appendices B and C of the Laws of Chess), except where they are overridden by the specific provisions of these regulations: a. Players need not record their moves. An Arbiter will record the moves (Article B3). b. Once a player has completed ten (10) moves, no claim can be made regarding incorrect piece placement, orientation of chessboard or clock setting. In case of reverse King and Queen placement, castling with the King is not allowed (Article B4). c. The player whose turn it is to move, may consult the Arbiter’s score sheet, and, if his next move will produce a threefold repetition of position (according to Article 9.2a of the Laws of Chess), or the 50 moves rule (according to Article 9.3a of the Laws of Chess), he himself must write the intended move on the score sheet and claim the draw, if he wants. If the claim is found to be correct, the game is immediately ended as a draw. If the claim is found to be incorrect, the Arbiter shall add three (3) minutes to the opponent’s remaining time and additionally shall deduct half of the claimant’s remaining time up to a maximum of three (3) minutes. d. The Arbiter shall call the flag fall (Article B6). e. Article C3 does not apply. f. In the case of an illegal move the Arbiter shall interfere with the game only after a claim by the opponent and shall reinstate the position immediately before the irregularity. For the first illegal move made by a player the arbiter shall give two (2) extra minutes to the opponent. For the second illegal move by the same player the arbiter shall declare the game lost by this player. 3.7.5 Between the tie-break games as well as before the start of the sudden death game there shall be a pause of at least 10 minutes, unless the Chief Arbiter decides otherwise. 3.8.1 Only the players and steward (-es)s shall be allowed in the actual playing area except with the permission of the Chief Arbiter or his Deputy. 3.8.2 During the playing session the following additional regulations shall be in force: a) The players are not permitted to bring into the playing area technical and other equipment extraneous to play, which may in any way disturb or upset the opponent. The Chief Arbiter shall decide what constitutes extraneous equipment liable to offend the opponent. b) A player may talk only to an arbiter or communicate with a steward, or with his opponent as permitted by the Laws of Chess. c) During the playing session, players are not allowed to leave the playing area without the permission of the Chief Arbiter. The Organizing Committee shall provide score sheets according to the specifications provided by FIDE. a) At the end of each game the players’ original score sheets shall be given to the Arbiter, who shall hand them to FIDE. Score sheets will remain the property of FIDE. b) Refusal of either player to sign the score sheets shall be penalized according to Article 13.4 of the Laws of Chess. After the players have signed the score sheets, the Arbiter shall countersign to confirm the results. c) In tie-break games, the players and the Arbiter shall sign a result sheet. 3.10.1 The players are required to attend the Players’ Meeting on the day of the venue inspection at a time to be decided by the Chief Arbiter and the Organizing Committee. If necessary, the Chief Arbiter may call other Players’ Meetings. Provided the Chief Arbiter and/or the Organizing Committee are requesting more than the first Players’ Meeting (day of Opening Ceremony) the players shall have the right to be represented through their managers. 3.10.2 If a player fails to appear at the Players’ Meeting, the Opening or Closing Ceremony or any approved function of the Championship such as official receptions and press conferences, or conducts himself in a manner contrary to the spirit of sportsmanship or the FIDE Code of Ethics, then he shall suffer the following penalty: 5% of his prize money shall be forfeited to the Organizing Committee and a further 5% to FIDE for each breach. In cases of serious misconduct the player may be disqualified from the match and the World Chess Championship cycle. 3.11.1 The players are expected to co-operate reasonably with the media. General interviews with them can be arranged through the Press Officer and the team managers but it is understood that exclusive interviews shall be arranged only after the match has been concluded. 3.11.2 Both players are required to make themselves available for post game press conferences, of not more than 20 minutes duration, immediately after the game. 3.11.3 The players are required to be present at all official functions during the match including official receptions, the opening ceremony and the closing ceremony. 3.11.4 Players are requested to note the requirements of FIDE Regulations C.01 (Article 8.1) in respect of their appearance at all times during the matches. 3.13.1 Two (2) arbiters of the match will be selected by FIDE after providing a list of five(5)nominees to the Players. No arbiter may belong to the same Federation as either of the players. Exception: if both players are members of the same Federation, an arbiter may also belong to this Federation. 3.13.2 During play either the Chief Arbiter or one of his Deputies must be present in the playing area. 3.13.3 Immediately after the end of the match, the Chief Arbiter shall write a report and send it without delay to FIDE and to the FIDE Secretariat. 3.13.4 The report shall be written in the English language. 3.13.5 The report shall contain the result of each individual game as well as the final result of the match. In addition, the report shall contain a general description of the course of the event. If there were any difficulties, conflicts or incidents, they shall be described together with the measures taken to deal with them. 3.13.6 The report shall be supplemented by adding two copies of the bulletins and the original score sheets of the games shall be sent to FIDE. 3.13.7 The Chief Arbiter may, in consultation with the WCCC, and with the approval of the FIDE President, issue additional written regulations to inform the exact playing hours and take care of other details not covered by these regulations. a) an appeal against a decision by an arbiter, b) a protest against a player’s behavior, c) a complaint alleging false interpretation of the regulations, d) a request for the interpretation of specific regulations, e) a protest or complaint against any participant, or f) all other matters which the Committee considers important. If possible, the Committee shall reach a decision not more than two (2) hours after the submission of a protest. The appeals process shall include written representations and a written decision. The Committee shall endeavor to find binding solutions that are within the true spirit of the FIDE motto, Gens Una Sumus. Each protest must be accompanied by a deposit fee of 500 (five hundred Euros) or the equivalent in local currency. If the protest is accepted, the fee shall be returned. If the protest is rejected, the fee may be forfeited to FIDE. The written decision of the Appeals Committee arising from any dispute in respect of these regulations shall be final. 3.15.1 FIDE shall ensure the playing hall and its environs meet at least the requirements of the FIDE Regulations for the Organization of Top Level Tournaments (FIDE Handbook C.01). 3.15.2 The playing venue shall be decorated with the FIDE flag, IOC flag, the flags of the host nation and the participating countries. 3.15.3 After FIDE agrees with the Organizing Committee on the arrangements in respect of the tournament hall, facilities, accommodation and meals, transportation, telecommunication, ceremonies, etc., no objections from the participants shall be acceptable. 3.15.4 The Organizing Committee shall provide, free of charge, coffee, tea and soft drinks for the players and principals. It is advisable that the same offer shall apply for press members. 3.16.1 Only photographers and camera crew expressly authorized by the Press Officer may work in the playing venue. a) Flash may be used only during the first five (5) minutes. b) In tie-break games, flash may only be used in the first three (3) minutes. In case of 5 minutes + sudden death games, flash is not permitted; the use of cameras without flash may be permitted if the Arbiter in charge deems their use to be unobtrusive. c) Television cameras must be unobtrusive and may only be used if the Arbiter in charge deems their use to be unobtrusive. d) An official photographer, designated by the Organizing Committee with the approval of the Chief Arbiter shall be allowed to take photos at any time during the round without flash. 3.17.1 The Opening Ceremony shall take place one day prior to the first round and the participants are required to take part. 3.17.2 The program of the Opening Ceremony shall be supervised by FIDE. Cultural program and speeches totaling up to 60 minutes are usually welcome. FIDE Anthem, the Anthem of the hosting country and the anthems of the two players country. 3.17.3 The Closing Ceremony shall take place not later than one day after the end of the event and the participants are required to take part. The Organizing Committee shall provide a victory garland, a trophy and a gold medal for the winner and a silver medal for the loser. Anthem of the winner’s country, FIDE Anthem and Anthem of the hosting country shall be played. 3.17.4 The Organiser will provide the prize fund of the Challenger’s Match which is minimum 150,000 USD (free of any local taxes) to be shared equally between Mr Topalov and Mr Kamsky independent from the final result. 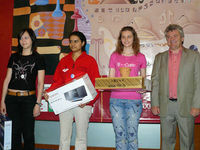 An amount of 20% over and above the prize fund (minimum 30,000 USD) will be contributed to FIDE by the Organiser. An additional fixed amount of 10,000 USD will be paid by the Organiser to FIDE towards the budget of the World Chess Championship Committee. 3.18.1 Travel. The FIDE President has the right to first class travel by air, sea or rail, at the Organizing Committee` expense. The FIDE Deputy President has the right to business class travel by air, sea or rail, at the Organizing Committee expense. All other Principals shall be provided with transport by air, sea or rail or, if they prefer, any other mode of transport that is not more costly to the Organizing Committee than air travel. Any Principal making his own travel arrangements without the agreement of the Organizing Committee does so entirely at his own risk. 3.18.2 Board and Lodging. For the FIDE President a suite in a first class hotel should be provided and for the Deputy President one junior suite in the same first class hotel. For each Principal – a double room in the same first class hotel. Extra expenses will be covered by the Organizing Committee only for the FIDE President. 3.18.3 Food and drinks. Provision for food and drinks shall be provided for all the Principals. This shall be provided by a specified allowance in local currency per day or by the provision of all meals in the restaurant of the hotel. The nature and amount shall be agreed between the Organizing Committee and WCCC. 3.18.4 Local transportation. Transfer from and to the airport will be provided by the Organizing Committee, if necessary. For FIDE President, a chauffeur-driven car. For the other Principals, a number of cars shall be made available; their use will depend on the position of the hotels, playing hall and media centre, and on the leisure activities of the Principals. Alternatively, a daily allowance in local currency may be provided, the amount to be agreed between the Organizing Committee and WCCC. Local transport shall also be provided for players to official functions if necessary. 3.18.5 Personnel – The Organizing Committee should provide sufficient personnel to assist in the playing hall, press room, VIP room, and at ceremonies according to the agreement made with the WCCC. 3.19 Procedures concerning the Organizing Committee. No proposed sponsor for the Challenger’s Match shall be in conflict with the regulations of the International Olympic Committee. 3.20 Other. At any time in the course of the application of these regulations, any grounds that are not covered or any unforeseen event shall be referred to the FIDE President, for final decision. 3. 20. 4. The Closing Ceremony shall take place not later than one day after the end of the event. The Organisers shall provide a trophy and a gold medal for the Women’s World Champion. Silver and bronze medals shall be provided for the runner-up and 3rd & 4th winners. If the two semi-finalists, who were eliminated in round 5, stay in the hosting city after their elimination in order to attend the closing ceremony, FIDE will cover their hotel expenses for this extra period. The FIDE Anthem, the Anthem of the World Champion’s country and the Anthem of the hosting country shall be played during the Closing Ceremony. 3. 21. 3. 2. Board and Lodging. For the FIDE President a suite in a first class hotel and for the Deputy President one junior suite in the same first class hotel. For each Principal or WCCC member – a double room in the same first class hotel. Also, hospitality shall be provided for three more FIDE people (FIDE Secretariat). Extras will be covered by the Organisers only for the FIDE President. 3. 21. 3. 5. Personnel. The Organisers should provide sufficient personnel to assist: the FIDE Secretariat, in the playing hall, press room, VIP room, and at ceremonies according to the agreement made with the WCCC.